Enabling has been described as a form of codependency you create with your loved one who is addicted. 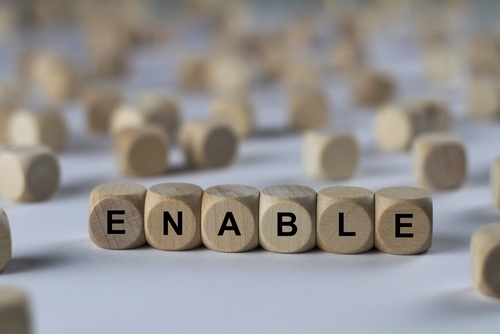 By dictionary definition, enabling is giving someone the authority to do something or to make something operational. When you enable a loved one’s addiction, you are not setting clear boundaries, enforcing clear consequences, and most often, you are not taking care of yourself. As a result, you are giving your loved one authority to continue their addiction as well as their addictive behaviors. In addition, you are making it possible for them to continue acting on their addiction. You ignore the greater problem: You know they have a drug addiction or a drinking problem, but you ignore it over all. Choosing instead to focus on the positives, you might be unwilling to accept, or ashamed to accept, that your loved one has an addiction. You might get in “trouble” for saying something: Addiction and alcoholism can be volatile. In the past, you might have repeatedly encountered negative consequences for raising concern or making a comment about your loved one’s drinking and using. You’ve tried every way possible to make your thoughts known, but they are shut down by aggressive or passive aggressive behaviors. You cover up their tracks: Legal issues, missing work, late payments, accidents- whatever happens in the wreckage of the trail of addiction, you are there to clean it up. You know that your loved one is sick and struggling, overtaken by addiction. Instead of enforcing responsibility on your loved one, you take it on yourself. You can’t accept that your loved one is an addict: There is a difference between accepting addiction is part of your loved one’s life and accepting that your loved one is an addict. Addiction takes away your loved one’s ability to rationally choose. However, your loved one does have a choice to get sober. Taking responsibility and accountability is important for addicts in their recovery. They need to define their agency in life which means taking responsibility for their addiction and their behaviors under the influence of drugs and alcohol. When you are unwilling to accept their addiction, you create a victimizing role which emphasizes their weaknesses rather than their strengths. In order to quit and successfully recover, your loved one needs to know they are strong, capable, and courageous. Hired Power knows it can be difficult to address addiction and get a loved one the help they need. That is why we help families plan interventions, transportation to treatment, and aftercare services. Our compassionate family wants to empower yours to focus on healing and bring recovery home. We are here to support you every step of the way. You are not alone. For more information on our recovery services, call us today at 800-910-9299.